Last Fall I shared with you how much I loved the glamorous fashion line, Marchesa's debut fragrance* MARCHESA PARFUM D'EXTASE Eau de Parfum. That's why I was thrilled when I learned they had just created a new product in the line, the Hair Mist. Everything that makes the Eau de Parfum fantastic - the warmth and sophisticated floral touches without the common sweetness, is here in the hair mist. It's just a touch lighter than the fragrance, which made it perfect for layering together the Parfum without feeling overwhelmed (or that I was overwhelming other people in a room!). There are just a few tweaks in the fragrance notes, but overall, the effect is very similar to that of the Parfum. *Click for my MARCHESA PARFUM D'EXTASE Eau de Parfum review. Iris Flower, Freesia, Black Current, Young Violet Leaves, Lotus Flower, Night Blooming Jasmine, Bulgarian Rose Water, Orange Blossom, Iris Root, Ambrox, Captive Musks. 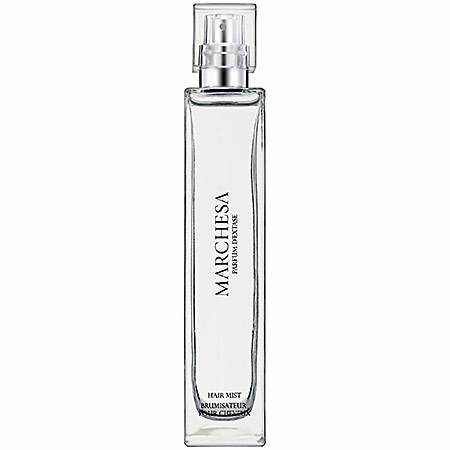 *This product was provided courtesy of Marchesa PR for reviewing purposes.